I’m a yoga and meditation teacher, and a Sanskrit instructor, living in Bayfield, Wisconsin along the beautiful shore of Lake Superior. After owning a yoga studio for nearly ten years in Ripon, Wisconsin, I moved here with my husband in 2016 to join this wonderful community, and to be closer to nature and to family. I teach regular group yoga classes in Bayfield and Washburn. I offer Introduction to Sanskrit weekend immersions at yoga studios and other venues. I teach a style of yoga that is innovative yet rooted in tradition, based on what I have learned from teaching yoga since 2001, from ongoing study with wonderful master teachers, and based on my own practice. Most of all I am interested in offering yoga that helps people to feel truly well, and in a way that is accessible to real human bodies in all conditions. What do these three things have to do with each other? Yoga and meditation are embodied practices that help us to unwind habitual patterns, awaken “body blind spots”, create a more balanced and resilient nervous system, and a mind that is more Sattvic—calm and clear. These two practices complement and support each other, and one sometimes merges into the other. For example, meditation, most often a practice in itself, also happens in breath-centered movement, the kind of yoga I most often teach. Sanskrit, the ancient language of both yoga and meditation, uniquely names yogas poses and meditative states and techniques. It is also an embodied practice. Studying Sankrit, which includes chanting, gives direct experience of meditation, and enriches one’s experience of yoga practice—especially valuable for yoga teachers and serious yogis. It’s not necessary to yoga or meditation, but it is a fun and powerful experience for those who want to take the plunge into this direct experience of sound and vibration. What ultimately connects these three is that they are all ways in which we can wake up to, or realize, our true nature, our essential Self. Here is something about my background in yoga,sanskrit and meditation. I worked for five years as an “itinerant yoga teacher”, lugging yoga mats and props, teaching in various locations, all the while developing a desire to have my own studio. I kept an eye open for the right spot for several years. In 2006 my husband Vydun and I found a vacant storefront on the main street of Ripon, Wisconsin. I called it Marigold Yoga—joining in double meaning the quintessential American everyday flower with one of India’s sacred blossoms. This represented my intention to de-mystify yoga, and create a welcoming, accessible place for my local small-town community. I also loved bright orange, and its simple and joyful message. One of my goals was to bring in other yoga teachers—both regular, and visiting—so students would experience different teachers and different styles, and so we could all learn more together. I am thankful that I was able to do that, and over the next few years I had the pleasure of creating and leading four in-depth yoga teacher trainings at Marigold, offering some of these new yoga teachers a place to teach, and a launching pad for their own evolving development. I am grateful that our small studio was able to host some amazing master teachers over the years, such as Zoe Mai and Jules Mitchell—among others. Bringing in other movement modalities was another goal for me. Soon after we opened, we began offering Tai Chi cIasses, and they became a studio staple. Thank you to Vydunas Tumas for his years of dedication to offering the internal practice of Wu Style Tai Chi. 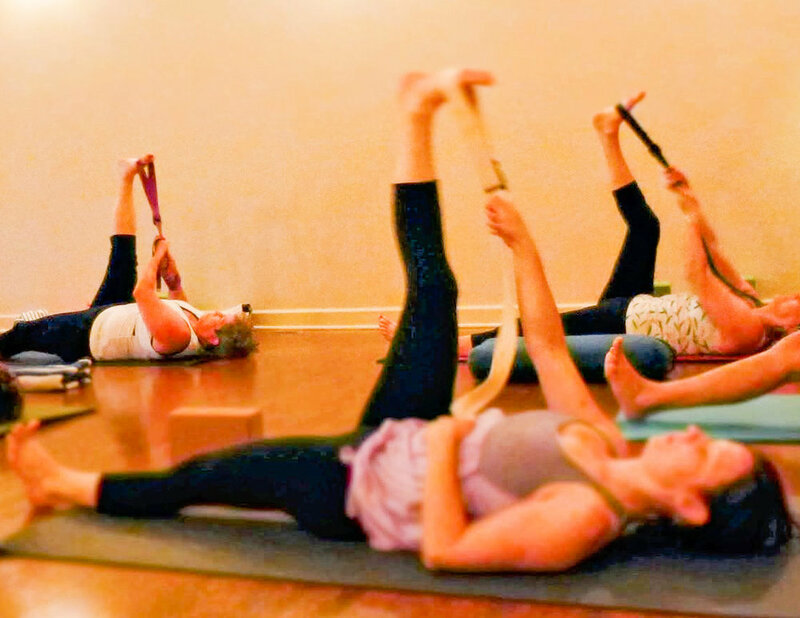 Marigold Yoga became my sanctuary, a place where I had the privilege of sharing this practice, of connecting to so many who were drawn to yoga. I developed and grew as a teacher, learning most of what I know about yoga from long-time and even short-term students. Deep bows to them all. 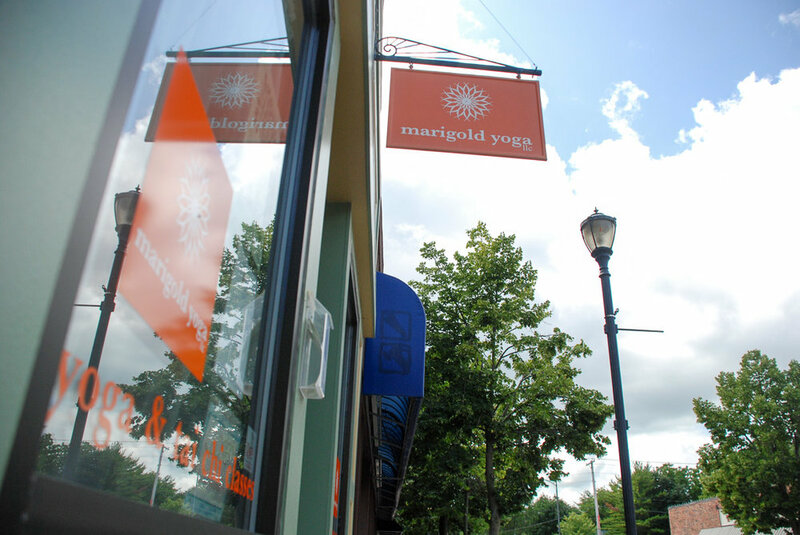 I sold Marigold Yoga in August 2016 to one of my longtime students, Tracy Matthias. She had been one of my first students, when she herself was in high school. She has renamed the studio Lotus Root Yoga, and after a year moved it up the block to a new location. Its essence lives on in its students, and in Tracy, who realizes that yoga is a serious yet joyful endeavor.